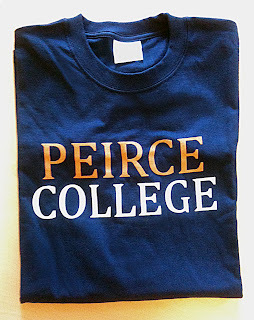 Peirce, you'll get a shirt and a public thank you! Have you ever wondered what it would be like to go back to school with your mom? Kristina Botti did just that. This mother-daughter duo turned Peirce into a family tradition when Kristina followed in her mom Kelly's footsteps to return to college (mother knows best!). We weren't surprised -- many of our students find their way here through family, friends, or colleagues who have come before them and suggest they check us out. Kristina and Kelly talked to us about how they found themselves at Peirce at the same time and how things are going. But before we share their story, we want to remind you that a referral doesn’t just benefit the student who ends up enrolling -- all of you referrers out there deserve to know how much we appreciate and recognize your role in bringing future students to Peirce. In addition to the rewards traditionally offered through our Referral Program, every student or alum that refers a new student to the College will now be publicly thanked in our Referral Honor Roll and will receive a new special edition Peirce College T-shirt. And now, the story of Kelly Blair and Kristina Botti! At age 19, Kelly delayed her education to become a mother. She was a stay-at-home mom for many years, but when her husband became disabled, it was her turn to support the family. In order to work her way into the career path she wanted, she realized that an education was a necessity. While pursuing an associate's degree from Harrisburg Community College, she came across a lot of information about Peirce College. She did her research and found that Peirce offered a high-quality, accredited Paralegal Studies program -- exactly what she was looking for! Today, Kelly is working towards her bachelor's degree in Paralegal Studies, with plans to graduate in December and pursue a career in a local law office. She lives in Belmar, N.J., with her husband and youngest son. As the youngest in a family of nine, Kelly will be the first member of her family to earn a bachelor's degree! But she won't be the last. "I decided to refer my daughter Kristina to Peirce because I had seen her struggling with different online schools, and they did not seem to offer the education that Peirce offered. Also I knew if she needed some assistance, she lived nearby and could go to the Walker Center if needed." Despite her mother's encouragement, Kristina wasn't always so sure that college was the right path for her. "After graduating high school, I did not feel that I was right for college," she recalls. "I wasn't sure what I wanted to spend the rest of my life doing and did not want to waste time and money going to school for something I did not want to have as a career." She tested the waters by trying out a few online schools, but never truly felt like a student. It took several months for Kristina to heed her mom's advice to look into Peirce College, but when she did, she became convinced that Peirce was the right school for her. Thanks to mom's advice, Kristina is now working towards her bachelor's degree in Healthcare Administration, with hopes of pursuing a career in a physician's office or hospital after graduation. "I am so thankful to her for pushing me to change schools," says Kristina. "Not only do I feel like I am actually a member of the school, but I also feel like they actually believe in me." Both mother and daughter value the supportive environment they found at Peirce. Although she is only in her first semester, that has been palpable to Kristina from the start. "I really like the fact that all I have to do is pick up the phone and call my professors, or just walk into the Walker Center if I need help." For mom, it has been the support of her professors that has made all the difference. "I value the professors that I have come in contact with. I find them to be helpful, and very knowledgeable, with so much compassion. Back in September, I lost my brother to scleroderma. I contacted both my professors to ask for some extra time so I would not have to worry about school work, and could mourn with my family. I was granted an unlimited amount of time. This meant so much to me, that I felt so overwhelmed by the compassion they showed." Going to school together has created a good-natured rivalry between mother and daughter. "Being in the same school as my mom has not only been an educational experience, it has also been fun," says Kristina. "I find that I am teasing my mom about slacking on her homework -- it is almost like a competition to see who finishes their weekly work first. I must say, I win most of the time!" When Kelly and Kristina aren't studying, they can be found at the beach, or spending time with the rest of their family. So would the referred become a referrer? "I have actually been asked a few times within the last month where I attend school," says Kristina. "After talking to a few people, I would not be surprised if they actually look into Peirce. This school truly is amazing." Both Kelly and Kristina have plenty of advice to offer other working adults who are considering going back to school. "Do it now, before it gets any later in life," says Kristina. "Even though I am only 25 years old, I have found it extremely hard to focus on assignments that I think would have been easier if I would have gone to college right after high school!" And from mom's perspective, it all comes back to setting a good example for your children. "Don't question it, JUST DO IT, you will not regret it ... you are never too old. And yes, it might take you longer, however it is such a great experience and a proud moment. I also believe that if you have children and you show them that yes, anyone can go to college and earn a degree, the children will be proud of you, but you are teaching them as well." Does the journey of Kelly and Kristina sound familiar? Spread the Peirce pride, share your story, and join our Referral Honor Roll today!